The conversion allows the integration of the new Hi-Res portable devices equipped with coaxial digital output (75Ω) and smartphones with analog output on 3.5 mm mini Jack (also 4 poles) with Audison processors featuring an optical digital input compatible with the resolution of the signal sent to the C20. Thanks to its extreme compactness, the C20 can be installed in a hidden position on the dashboard, drastically reducing the length of the cabling between the portable player and the receiving device nullifying in this way any issues with interfacing. The coaxial digital input is provided with an isolation transformer that improves the balance between the transmitter and the receiver circuit, reducing noise due to EMI electromagnetic interference, which is particularly insidious inside the passenger compartment. 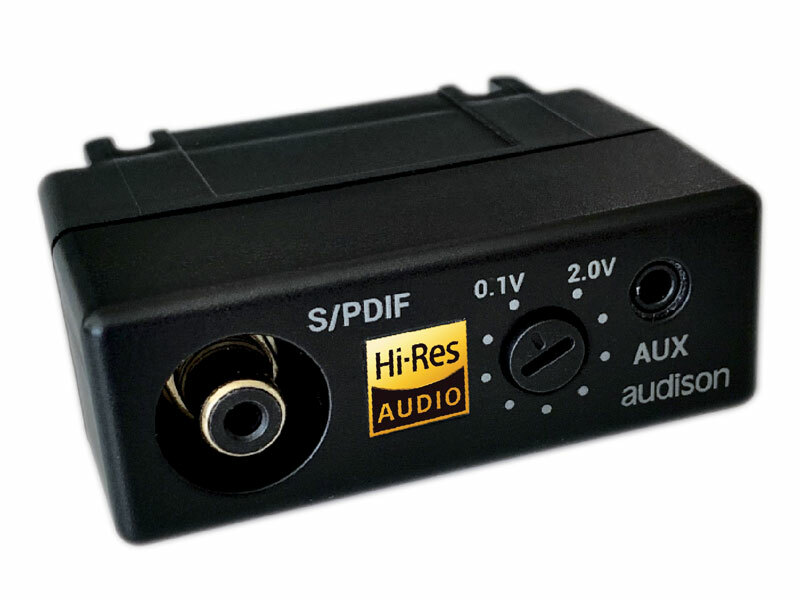 The AUX-IN input is equipped with a pre-amplifier with adjustable gain of 0.1V ÷ 2V for an optimal coupling with each device before the Analog-Digital conversion is performed by a high quality converter at a resolution of 24 bit/48 kHz. For maximum ease of use in cars, the C2O independently selects the input with priority assigned to the AUX-IN. With the default setting, after 6 seconds of no analog signal, the C2O moves to the coaxial digital input. An internal switch allows for the time before the switch to be set to 9 or 12 seconds. According to the definition of HiRes audio provided by JAS (Japan Audio Society - jas-audio.or.jp), C2O achieves the 24 bit / 96 kHz digital to analog conversion processing requirement. Pure digital signal transfer with a resolution up to 24 bit / 48 kHz.